Last Sunday, June 14, 2013, Pastor Ed and Pastor Mike give a report on the progress of the Next Generation Project, which we started last November. The Pastors and Elders would like to invite all adults who consider Reston Bible Church their church home to join us at one of two upcoming Town Hall meetings. The meetings will take place in the sanctuary tonight (Tuesday, October 9) and next Monday, October 15, at 7:00 p.m., and should conclude by 9:00 p.m. each night. These meetings will give you an opportunity to hear some of the vision we believe God has for us as a church, why we think He’s giving us this vision now, and what the stakes are as we consider what the Next Generation Church is. This will also be an opportunity for you to share your ideas with us, and to ask our leadership questions. Childcare (up through 5th grade) will be available at no cost at the October 15 meeting only. Please click here to register your child(ren). Your involvement in one of these Town Hall meetings really matters to us as we approach our next season as a church, and we hope you can join us. This fall, the leadership of Reston Bible Church will introduce what we are calling The Next Generation Project. We have rejoiced at great blessings from God since moving into our new church home two years ago. Since our relocation, we have seen our church family grow, and with it, our ability to know Christ and make Him known locally and globally. We are deeply thankful to God for this wonderful season of growth and momentum. Our church is a family, and like most families, we have a mortgage on our home. This is no surprise and was part of the plan when we built this campus. A major portion of The Next Generation Project is purposed to aggressively reduce our church’s mortgage balance. We are in excellent financial condition, thanks be to God. But In this season of growth, it is our desire to proactively move forward and invest our finances in ministry, while unhindered by a mortgage balance. Simply put, the sooner we reduce the balance on that mortgage, the less we’ll spend on interest and thus the more we can invest in our current ministries and in new ministry opportunities. 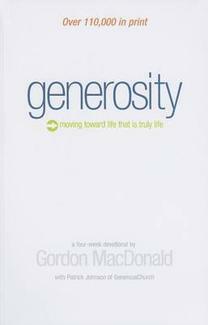 In preparation for The Next Generation Project, the leadership is asking every adult in the church to read an excellent little book written by Gordon MacDonald called Generosity: Moving Toward Life That is Truly Life. It is biblical and very helpful. We pray you will take time to read Generosity, pray for our church as we move into The Next Generation Project and consider what your part might be in that. Generosity is available for download on Apple iBooks and on Amazon Kindle. On September 16, we will also have hard copies available at the Welcome Desk during weekend services. » Enter “Gordon MacDonald Generosity” in the search bar. » Select the Generosity entry and then tap the FREE button. » Enter your Apple ID password to begin downloading. » Select which device you would like to have the book delivered to from the “Deliver to” dropdown menu. » Click the “BUY NOW WITH 1-CLICK” button. The book will be available immediately on your Kindle device or on the Kindle Reader app, if you have one installed on a compatible smartphone or tablet.